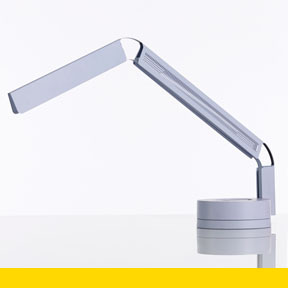 Fade Task Light uses minimal amount of parts, reducing the cost of production and the timeline for manufacturing. High quality materials ensure longevity and an ongoing, positive relationship with the brand and customer. Its LED array saves energy. Eyestrain is reduced when the light color temperatures are shifted to match the task at hand and the time of day. Its arm movement is fluid and adaptable, leveraging two magnetic assisted spring hinges that articulate a full 120˚ range. Designed by: Box Clever for Fade Studio Inc.